iCraft is an online venue that connects artists, designers and craftspeople to those who appreciate their work. It is a place where artisans and crafters can showcase their handmade pieces for sale. Here is a Creator Interview with Brilliant Beads, from London, Ontario who loves to work with glass to make lampwork beads that are inspired by nature. 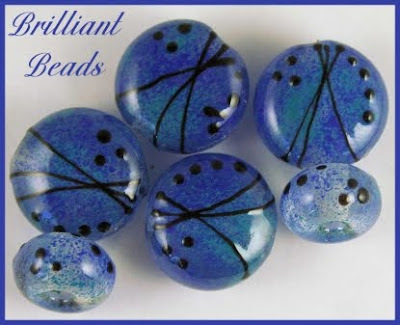 I love the blues in these beads - they are so rich and so bubbly water light at the same time! Art, whether in my professional life as a dentist, or in my part-time life as a lampwork and jewelry artisan, occupies a good portion of my consciousness at any one time. I have memberships to several local and regional art galleries, and I always make time when travelling to visit local art exhibits. My family and my home are my “comfort ground”. I have a wonderfully supportive husband, and four terrific children…27, 23, 18, and 15 years old. My husband built my glass studio for me, and is a great source of insight and guidance when it comes to the “how can I accomplish that?” questions. I live in London, Ontario, Canada, in a house with a big lot that sweeps down into a ravine. Regular visitors to our yard are deer, fox, skunks, raccoons, and a great horned owl. I call it my little slice of paradise. My iCraft shop contains both lampwork beads for jewellery designers and finished jewelry pieces that I have made. I love to see what other jewelry designers use my beads for and would love to use my iCraft shop as a platform to expand my business. I’ve been crafting since I can remember…I got my first “paint by number” black velvet oil painting kit when I was seven. Crewelwork and knitting was next, beadwork and cross-stitch followed, sewing, and mosaic art. I’ve always been fascinated by glass and took my first lampworking course three years ago….eureka, this is IT!!! I was making jewelry for family and friends, and they suggested that I could sell it to others. I learned the rudimentary part of website design, and obtained a small business license. I like having an online business because the rest of my life is so busy and selling online allows me to tailor the amount of time I can spend. What is your favorite item in you shop? This lampwork bead, Swarovski crystal, and wooden bracelet is my favourite. I love the different textures all combined in a neutral, organic-looking piece. What’s your favourite thing that you have ever made? I made this necklace and was so tempted to keep it for myself, but happily it sold to a lady in California, and it has a good home. What’s your most memorable sale? 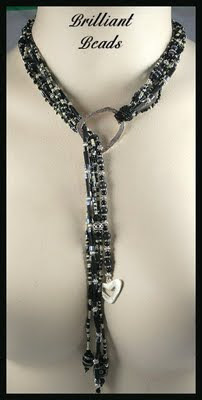 My most memorable sale was the necklace shown above, because the customer also bought 6 other pieces at the same time! That was a great feeling that doesn’t come along too often. I love nature and the natural world around me…colors, shapes, vistas. My inspiration is often acquired from hiking in rugged countryside, the Rocky Mountains are my favorite. Tell us about a favorite designer. Nathalie Girard of Canadian Rockies Art is an amazing metalsmith…I love her designs! I love blues and aquas and seem to gravitate to those when I’m working with glass. I love to wear earth tones such as brown, rust, and olive green. What's your favourite room at home? Why is it your favourite? I love to sit in our sunroom, looking out into the forest and ravine in our backyard. It provides me with inspiration and is a great place to unwind after a long day. Do you have a glass working tip you'd like to share with readers? I find that as I get older it has become particularly important to work with good light. I also broke down and bought a pair of magnifying glasses to help see the tiny beads I use…now I couldn’t do without them! What are your favorite blogs or website? What are your favorite magazines and or books? I love to hike and cycle…I find getting my heart rate up a bit takes the stress away. I’m not a sit on the beach kinda gal. I love the tutorials over on Splitcoast Stampers! The newer ones also come with a video version at the end. I don't have a gallery there, but I do peruse tutorial creations from time to time. I recently tried out the Pizza Box tutorial! I just stuffed it with a few goodies since my house is overflowing with Hallowe'en excess! We're going to give this one to the little girl who delivers us the Mississauga News. It was so fast to make I just had to try some more! This one is made with the SEI holiday paper line called chocolate mint. I also tried a rectangluar box with my own Christmas Tree die cut. These are just simple ones, since they are my first, but the possibilities of box toppers is endless! I think these boxes would make fabulous gifts with matching cards inside. You can make a mini box to hold gift cards, love notes or thank-you notes. You can also make an A2 (invitation) sized box from a 12.x12 piece of cardstock to house greeting cards! Thank-you, Splitcoast Stampers! Check out their members' pizza box gallery too!